Known for its huge collection of antiques, Casa Museo Ivan Bruschi in Arezzo has begun hosting special events over the past year as well, drawing more visitors to the oft-overlooked museum. Ivan Bruschi was a prominent antiques collector in the 1960s who founded the Arezzo Antique Fair in 1968 (which still runs on the first Sunday of the month and the Saturday before). Born in 1920 to a family that also loved antiques, Bruschi moved to Arezzo in the early 1960s to restore his family’s 13th-century Palazzo del Capitano del Popolo, which was an important public building in the Middle Ages but was damaged in World War II. 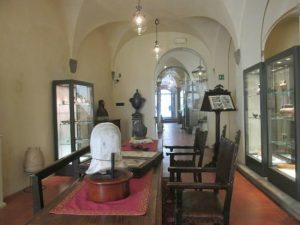 Bruschi died in 1996 and left his collection of more than 10,000 antique items and his property to the Ivan Bruschi Foundation, which opened the Casa Museo Ivan Bruschi after his death. The museum is located inside Palazzo del Capitano del Popolo (Bruschi’s former home) and adjacent to the Basilica di San Francesco, and has been described as a “place of wonder.” The extensive and eclectic collection is spread out over 16 rooms, and spans from 22,000 BC (the Paleolithic era) to the 20th century. The items come from varying regions of the world, such as Asia, Africa, and Central America, and include everything from artwork to books, jewelry, costumes, coins, tools, and furniture. There is an impressive archaeological collection and a similarly notable collection of jewelry, which features pieces from the Middle Ages and the 19th and 20th centuries as well as an ancient Roman gem cutter. The collection of paintings is small but contains noteworthy pieces such as the terracotta Redeemer by Giovanni della Robbia. The clothing collection is also small, but includes liveries and garments from Asia. Current events include “Shine On,” held in the museum’s Gallery in Piazza San Francesco. The exhibit showcases precious jewels, contemporary art by Francesco Pignatelli, and a virtual reality experience that highlights frescoes by Piero della Francesca. Summer hours: Tuesday-Sunday 10 a.m. to 7 p.m. Closed Mondays. Winter hours: Tuesday-Sunday 10 a.m. to 1 p.m. and 2 p.m. to 6 p.m. Closed Mondays.